When the binder is set and cured and any additional water has dried out of the mixture, the resulting material is hempcrete. Unlike many construction composites (such as concrete, mortar and plaster), the binder portion in hempcrete is not intended to fill all the voids between the hemp particles, but only to coat the particles and cause them to adhere to one another where they touch. A hempcrete mix typically has a high percentage of void space in the final mixture. Hempcrete has a range of desirable thermal, structural and moisture-handling properties that make for an excellent building insulation material. 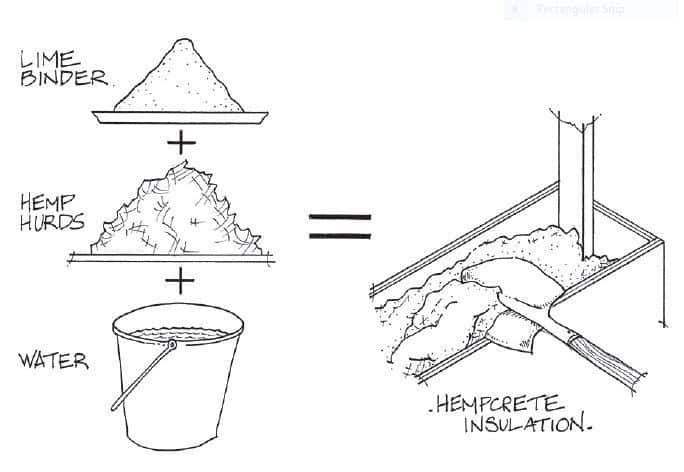 Depending on the mix variables, hempcrete can be used as roof, wall and/or slab insulation. 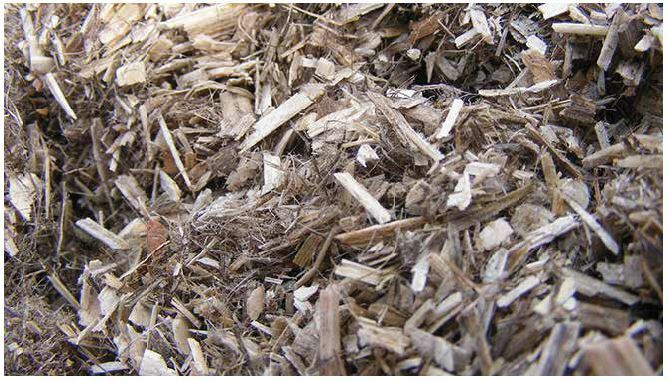 Any discussion of hempcrete is complicated by the fact that all three elements in the bio-composite can have a range of types and characteristics, and can be added to the mix in varying ratios. The hemp hurd is the woody core of the hemp plant. 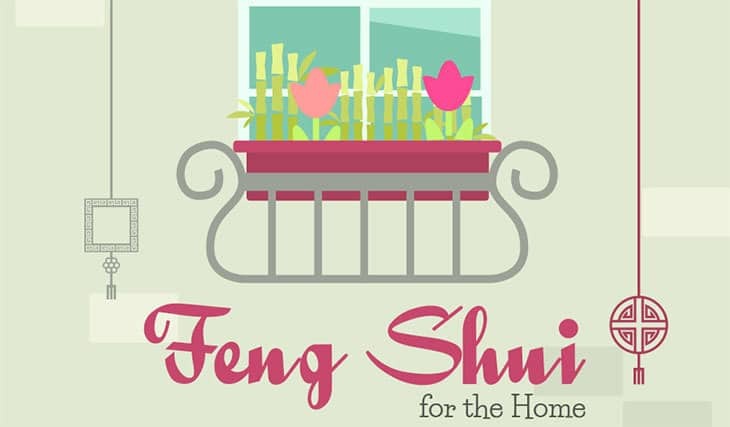 It’s typically sourced from hemp fibre producers after the valuable hemp fibre has been stripped from the outside of the hemp stalk, leaving the hurd as a by-product. Variables in the hurd portion of the hempcrete composite include size and grading of the hurd and volume and length of hemp fibre. Hemp with a bit of fibre. The fibre content of the hemp hurd will have a large impact on the qualities of the final mixture. A high percentage of fibre increases density and strength at the expense of thermal performance. Most hempcrete mixtures use little or no fibre. 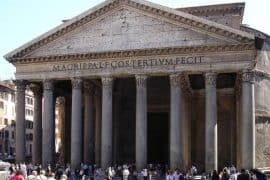 Lime has been an important binder in construction for thousands of years, largely in mortar and plaster recipes. There are different types and grades of lime, and there are various additives that may be included in the binder ratios. These variables will affect the setting time, strength and durability of the hempcrete mixture. There are several brands of manufactured lime binders made specifically for use in hempcrete, and there are recipes for creating lime binder from separate ingredients. The volume of water added to a hempcrete mixture will have a dramatic effect on the results, even if the hurd and lime variables are controlled. Hemp hurd is extremely porous, capable of absorbing a volume of water that’s much larger than what’s required for a good hempcrete mixture. Too much water in a mixture can result in higher density, issues with setting for the lime binder and excessively long drying times for the hempcrete. The final—and also critical—variable is the placement of hempcrete into the building. In wall and floor applications, the material requires some manual tamping in order to ensure that the mix is well bonded and has integrity. However, the amount of tamping can have a major impact on the density of the final material, even if all the mix ratios are identical. Variations in density can have a large impact on thermal performance, so this is an important variable to try to control. A great deal of this book is intended to help builders find the ideal ingredients and mixtures in order to be able to use hempcrete successfully. But the variability in the formulations and ingredients make it difficult to make blanket generalizations about the performance parameters of hempcrete, especially compared to manufactured insulation products that come from a factory with little or no variation. Throughout this book, a concerted effort has been made to use relevant testing data, based on knowledge of the variables, and to point out where the testing data is incomplete or inconclusive. The building industry doesn’t see very many “new” materials. The materials used to insulate residential and commercial buildings have remained the same for decades, and most have serious environmental and/or health impacts. As we collectively begin to add more insulation to buildings to lower their energy requirements, the volume of insulating material we use is going to rise dramatically. It makes ecological and financial sense to fill this volume with materials that are annually renewable, low-impact and, ideally, sourced from waste streams or from by-products from other processes. Hempcrete meets all of these important criteria, and compares favourably with conventional insulation materials in many ways. The ingredients for making hempcrete aren’t common building materials, and as such, they don’t benefit from the volume price breaks of other insulation options. Still, even prior to wide market availability and the cost reductions this will bring, the cost of hempcrete is comparable with other insulation options, while bringing advantages over those options in other ways. The variability in hempcrete pricing is reflected in the chart below, showing that proper attention must be paid to sourcing affordable materials. Hemp sourced from Canadian producers is considerably less expensive than that imported from Europe. Hempcrete is unique among the plant-fibre insulation materials (cellulose, wood fiber, straw bale, straw/clay, cotton) in its ability to maintain integrity in humid conditions. Like all of the plant-fibre insulation options, hemp hurds are able to store a great deal of moisture because of their porous structure; the moisture is adsorbed onto the large internal surface area of the plant fibres and absorbed into the cellular structure. This storage capacity is very helpful in allowing the material to take on moisture when it exists and to release it when conditions allow. A study performed in France found that up to 596 kilograms (1314 pounds) of water vapor could be stored in 1 cubic metre (35.3 cubic feet) of hempcrete, providing storage capacity for a sustained elevated relative humidity of 93 percent without overwhelming the capacity of the material to adsorb moisture. The advantage of hempcrete over other plant-fibre materials and conventional insulation types is found in the properties of the lime binder. Lime has a high pH and is inherently antimicrobial and antifungal, and the lime coating around each piece of hemp hurd in the mix creates a surface that resists the development of mold even when the humidity and temperature conditions would cause mold to occur on other insulation materials. This resilience in the presence of humidity or even liquid moisture makes hempcrete unique among insulation materials and a desirable choice in both cold and hot climates and anywhere where humidity levels are high. 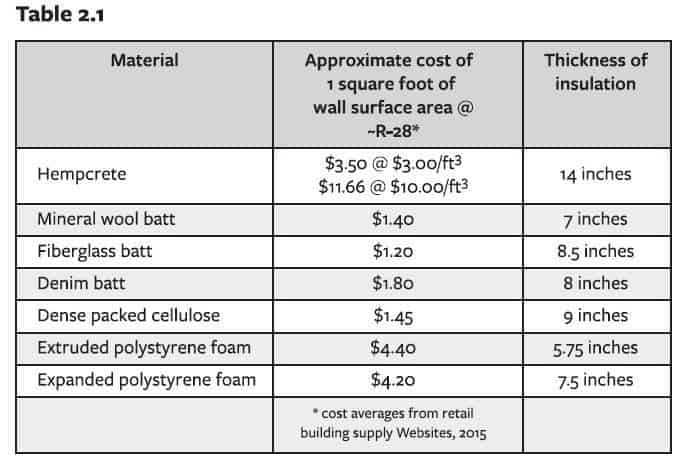 Hempcrete has a density that allows it to play a minor structural role in the building—unlike batt, loose fill and spray insulation materials in the cost chart above. Hempcrete insulation doesn’t have the structural capacity to fully support roof loads, but cast around conventional wall framing or double-stud framing, it can help restrain the studs from bending or buckling under loads, thereby increasing the load that can be carried by each framing member. Testing at Queen’s University in Canada showed that a 2 x 6 wood stud with 313 kilograms per cubic metre (19.5 pounds per cubic foot) of hempcrete infill could support three to four times the compressive loading of a standard stud wall due to the support the hempcrete provides to the wood stud in weak axis bending. 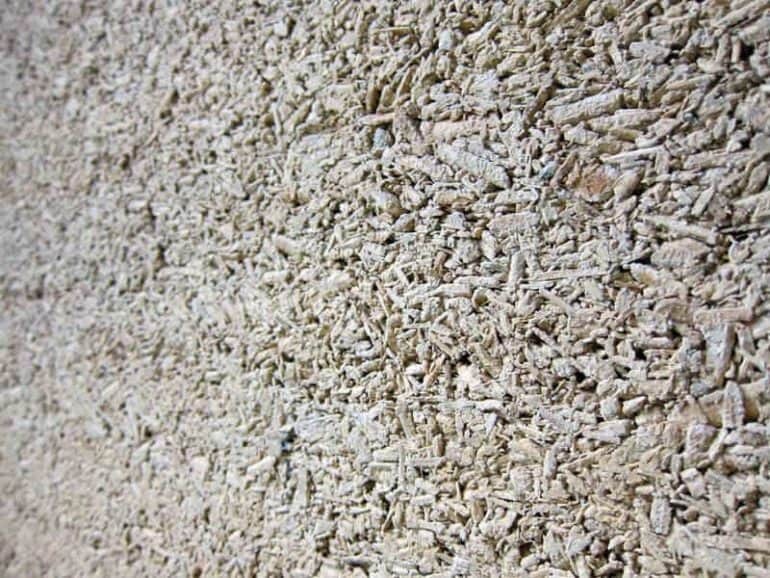 The rigidity of hempcrete insulation and the textured surface it presents on the face of the wall makes an excellent substrate for plaster finishes without any need for mesh or other bonding agents. Hemp is an agricultural crop that has particularly high yields. A study by the U.S. Department of Agriculture found worldwide yields ranged between 2.5 to 8.7 tons (approximately 2.3 to 7.9 tonnes) of dry straw per acre. This compares favorably to yields for wheat straw of 1.25 to 2.5 tons (approximately 1 to 2.3 tonnes) per acre. In terms of the amount of biomass available for use from a single crop, no other plant provides as much volume as hemp. The hemp plant is typically grown for either the strong fibre it produces or for seed (rarely for both at the same time). In either type of hemp production, the hurd isn’t the primary use and is considered a by-product. It has some market value as animal bedding and can be compressed into fuel pellets, but large-scale hemp production can generate tons of hurd for the insulation market as producers supply fibre or seed to their primary markets. According to a 2003 study, 716.6 pounds (325 kilograms) of CO2 are stored in one tonne of dried hemp. Tradical, a hempcrete manufacturer in the U.K., cites a study showing that their hempcrete product sequesters 110 kilograms of CO2 for every cubic metre of material (6.88 pounds per cubic foot) when the carbon emissions from producing the lime binder are taken into account. 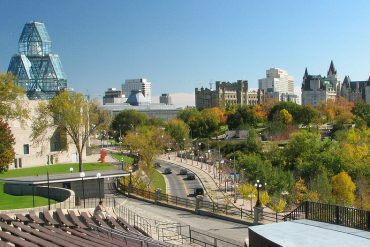 In Canada, about 200,000 new homes are built each year, with an average footprint of 2,000 square feet (185 square metres). If they were all insulated to code minimum requirements with hempcrete, a total of 990,718 tons (898,764 tonnes) of carbon could be sequestered annually. 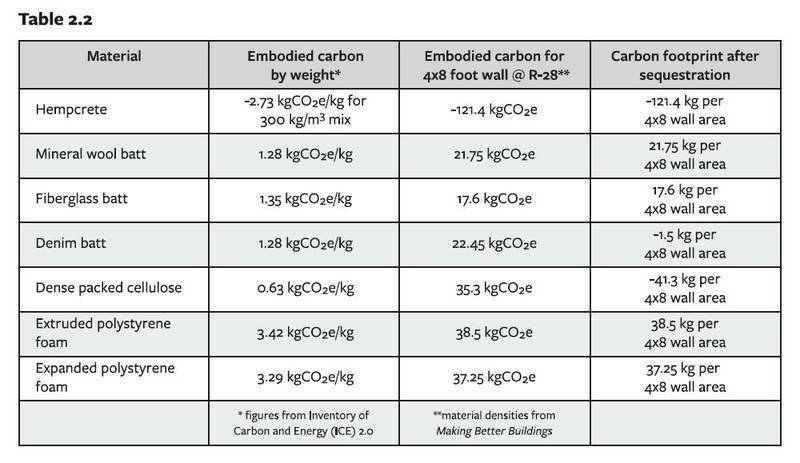 If the same homes had walls with fibreglass insulation, 207,345 tons (188,100 tonnes) of carbon would be emitted to create that insulation, so the total net carbon savings for the planet is significant. Hempcrete is quite a benign material. 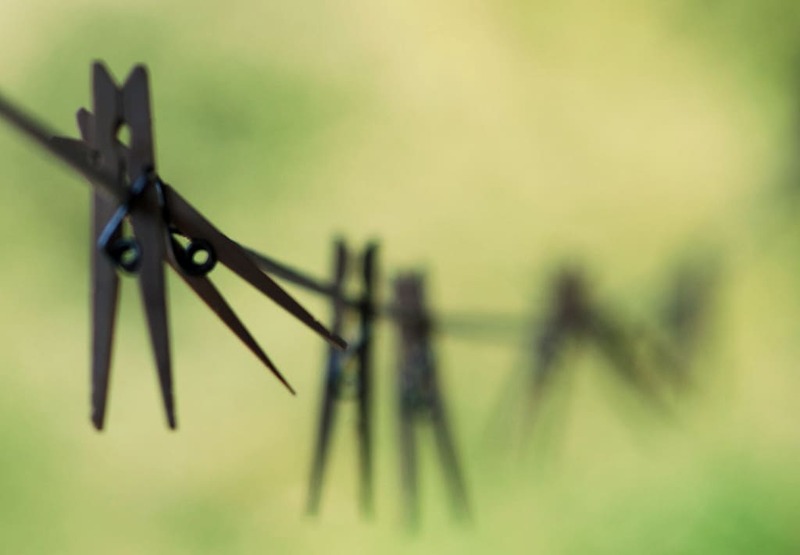 The farming process uses far fewer pesticides and herbicides than other grain or fibre crops, creating much less environmental damage due to the use of toxins on the fields. The crop does, however, require liberal use of fertilizer, which can have negative ecosystem impacts. Harvesting and processing take place without the input of heat or chemicals. The dry, powdered lime binder can generate a lot of dust during mixing, and is highly caustic. Adequate breathing protection must be worn by anybody handling the dry ingredients and working around the mixing station. When wet, the lime binder is mildly caustic to skin, so rubber gloves and fully covered skin are required. Once placed in the wall and fully cured and dry, hempcrete does not off-gas or release any toxins into the indoor environment. The lime is antimicrobial and antifungal, and the material is generally thought to have no ill effects on the indoor environment. The excellent moisture-handling abilities of the material can reduce the chances of a poor indoor environment due to excessively moist or dry air in the building. Reprinted with permission from Essential Hempcrete Construction: The Complete Step-by-Step Guide by Chris Magwood, 2016, New Society Publishers.